One of my bike shortcuts. New town and old cities meet at this intersection. On Linus Yng’s @ArchitourTokyo Western Tokyo bike exploration, the second stop was a fascinating corner. A wide and modern road (4 lanes, sidewalks)- Inokashira Dori (井の頭道り)- from the skyscraper district of Nishi Shinjuku meets a major ring road (6 lanes, sidewalks)- Kan-nana Dori (環七道り). The modern road dead ends into a narrow one-way street full of old sheds that must have housed many small businesses and residences in the post-war era. I was fascinated by Linus’ explanation of how planning created these large roadways, and paradoxically preserves old neighborhoods on the edge. Although many maps show the road continuing through this neighborhood, Izumi (和泉名店街), the money and priority must have become exhausted. What you see instead is a neighborhood preserved for decades because no one will invest in improving or replacing buildings that are in a right-of-way of a possible, future major road. In addition to the lane that runs in the center of the planned new roadway, Linus also pointed out the 10 to 15 story buildings that extend to the edge of where the road might one day be. In much of Tokyo, new buildings along major roads are often granted heights up to 15 stories, whereas the buildings behind them remain low. Tsukamoto Yoshiharu of Atelier Bow-Wow calls this the “cream puff pastry” of Tokyo urban planning, and explains that one function of these modern buildings, built to new standards, along the major roads is to provide a firebreak in this disaster-prone city. 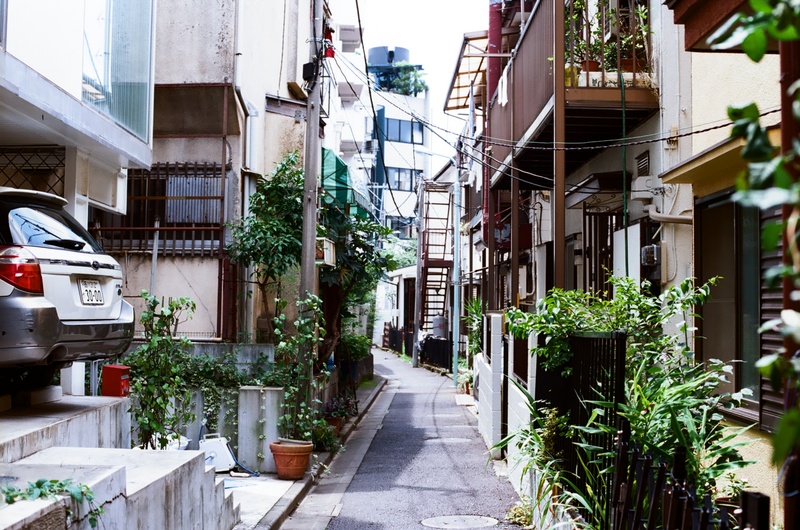 It is amazing that for the width of the proposed road, the neighborhood is a time capsule of a Japan that was rebuilding itself rapidly after the war. I’d like to go back and explore more about who is still living there, what businesses thrived in the post-war period, and what creative re-use may be happening with these provisional buildings that were never intended to last this long. UPDATE: Linus shared his excellent photos of this intersection with me later. Recently I had the great fortune to meet Handa Mariko, President of the Parks and Recreation Foundation, at her office near Tokyo Tower. She explained the work she does managing fourteen national parks run by the Construction Ministry, and her role as designer of the enormous Showa Kinen park in western Tokyo, on the site of a former US military base. Then, Handa-san took me and a senior executive of Hitachi, who kindly introduced us, to Shiba koen at the foot of Tokyo Tower. Shiba koen is a traditional Japanese garden surrounding an old sake building that houses a famous tofu restaurant called Ukai. The juxtaposition of tradition and post-war modernism, the protected pine tree and the aging metal tower is magical. Speakers include Tokyo University professors, government leaders, and international researchers. 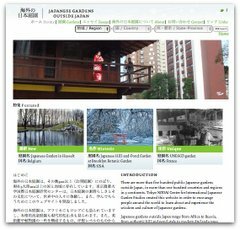 You can see the program online (in English and Japanese) and fill out a free online registration (Japanese only). The sponsor is IR3S, or the The Integrated Research System for Sustainability Science. On a beautiful warm November day, I discovered Tokyo University’s Sanshiro-ike garden. I had a few moments before a meeting, and saw on the campus map that there was a central garden on the main campus. I had assumed it would be a formal garden. I was very surprised to descend a small hillside and encounter this natural looking pond. Looking in all directions, one sees only trees, water and sky, despite the compact size of the garden. Even on a warm weekend day with early fall foliage, few visitors were there. I was enchanted by the incredibly natural and removed-from-the-city feeling in this garden inside central Tokyo and Japan’s most famous university. It takes a lot of artifice to make a city garden look so natural. The waterfall is amazing. Continue reading to see some more images from Tokyo University, aka Todai. An interesting blog post about Tokyo’s environmental paradoxes by Piers Fawkes of PSFK, organizer of the Pure Living Tokyo idea salon last month sponsored by Nissan. 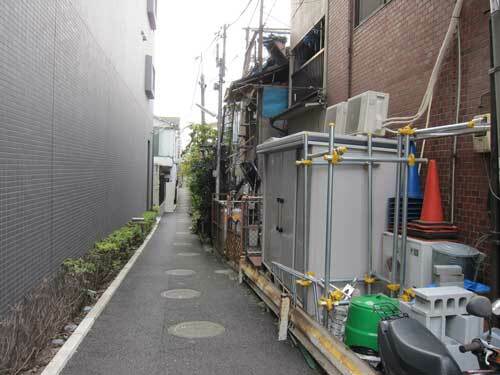 In a very brief visit to Tokyo, Piers captures in words and photos some of the achievements in energy efficiency and resource maximization, while also lamenting wasteful consumerism and the desire to appear modern. 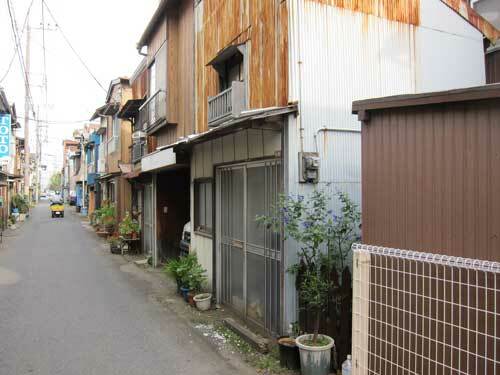 Garden Square is located on an enormous plot of land in a quiet residential neighborhood in Nerima, Tokyo. Most of the land looks wild, and is used by a landscaping firm as its nursery. The owner also constructed a rustic chic modern building, with a pastry shop and flower and plant shop on the first floor, and an Italian restaurant on the second floor. The back yard has a trellised vine, which on closer inspection, turned out to be a kiwi. Across the street is an open wood structure with more plants for sale, open to passers-by. Unfortunately, you cannot enter the nursery area. It is strange that this huge urban space appears more like a place for growing plants than retailing them. I am continuing to read Edward Seidensticker’s Kafū the Scribbler: The Life and Writing of Nagai Kafū, 1879-1959 (Stanford University Press, 1965). Kafū’s writing elegantly chronicles the Tokyo seasons, festivals, street scenes, and the clash of old Edo Tokyo with modernizing forces. The passage below seems particularly relevant to my previous post about the Tsukishima omasturi, and demonstrates Kafū’s love for the Sumida River, remnants of Edo, and nostalgic sounds.